Missing a good night’s sleep can easily ruin the following day, and often times the entire week ahead. Having to pay the sandman, we end up making up for it by sleeping late during weekends, which only further complicates our sleeping pattern. And if you find yourself experiencing numerous difficulties trying to fall asleep, and this persists on an ongoing basis, you might have a sleep disorder waiting to be addressed. Sleep disorders exist on a broad spectrum, and represent different chronic problems with sleeping, such as irregular patterns, trouble falling asleep, and numerous abnormal and unconscious behaviors during sleep. And if you struggle with one, your experience is not unique. There is a garden variety of sleep disorders, recognized by the American Academy of Sleep Medicine, and according to several institutes around the country, there are roughly 50 to 70 million people suffering from one sleep disorder or another, in the USA alone. Often times, these sleep disorders are hard to trace, and thus diagnose effectively. We misinterpret the sings, and generally attribute our lack of sleep to lifestyle and daily habits. The most common sleep disorders are Insomnia and Sleep Apnea. They too, manifest on a spectrum. Insomnia represents a difficulty falling asleep, as well as a difficulty staying asleep. Sometimes people experience one variety, and other times both are equally present. Over time, lack of sleep piles up and there is a chronic discomfort of feeling tired most of the time. The reasons for developing insomnia are numerous indeed. Causes: Poor sleep habits are usually detrimental, but you can easily attribute insomnia to depression and anxiety as well. It can develop as a side effect of taking certain medications, or sedentary lifestyle in general where there is a lack of proper and regular exercise. Symptoms: You will experience being tired on almost regular basis, and develop a chronic difficulty of getting asleep. Often times, people with mild cases of insomnia can nod off for a bit, and wake up not almost instantaneously. Currently, one third of Americans suffer from insomnia, regardless of age. It does tend to affect women more than men though. Treatment: While most people resort to sleep medication right away, that’s the last measure you should be considering. Instead, try improving your lifestyle habits, establish a bedtime routine, and resolve underlying causes such as stress and anxiety. Although not as frequent as insomnia, Sleep apnea affects one in five adults. The demographic group is primarily men, of all ages, and mildly to severely overweight. Sleep apnea manifests in three types, and these too vary in intensity. It is a very serious sleeping disorder where breathing stops and starts irregularly. Out of the three separate types, the most common is obstructive sleep apnea (OSA), which occurs when throat muscles relax. A more severe type is central sleep apnea, where the brain is not sending adequate signals in order to control breathing. An even more serious condition is when these two types are present at the same time, which is also known as complex sleep apnea syndrome. Causes: Generally tied to obesity and excess fat, sleep apnea occurs as a result of added weight and pressure to the neck, throat and jaw. Many times, it can manifest in people who are not obese as well. Symptoms: If you do not sleep with a partner, sleep apnea is generally hard to diagnose by yourself. Generally, you might feel tired even after a full night’s sleep. Otherwise, you’ll be snoring loudly and often times at irregular intervals, where breathing stops and starts interchangeably. Treatment: You’ll have to consult a doctor as soon as you experience the symptoms. Sleep apnea is a dangerous condition, and it should be properly monitored. Additionally, weight loss is heavily advised (no pun intended), as well as practicing oropharyngeal exercises (mouth and tongue exercises), that have a positive record of reducing snoring (in both potency and frequency) in patients with mild sleep apnea. While common sleeping disorders like Insomnia and sleep apnea can cause discomfort, leave you tired and make life unbearable after a while, there are other types that are equally burdensome and sometimes far more debilitating. These can be grouped in four separate categories, namely Hypersomnias, Sleep related moving disorders, Parasomnias, and Circadian Rhythm disorders. Depending on the type and potency, some of these disorders can be quite severe and seriously threaten your health. Hypersomnias are sleep disorders that bring about excessive daytime sleepiness, or a dangerous tendency to fall asleep at almost any time, and irrespective of the activity you’ve been doing. It goes without saying, that you can fall asleep during driving and even lose your life consequently, as well as hurting other people as well. In addition, hypersomnias can lead to mild or severe hallucinations, and loss of muscle tissue. Among hypersomnias, narcolepsy is the most common type of sleep disorders, affecting roughly about 5% of the entire population. In the USA alone, 200,000 cases are registered annually. Though its root cause is not entirely understood, several research papers trace it back to genetics, and several problems with brain signaling. Symptoms: Falling asleep during the day (often times without intention), cataplexy (rapid and sudden weakening of the muscle tissue), hallucinations while falling asleep and waking up, sleep paralysis. Sometimes there is a risk of REM sleep disorders associated with narcolepsy, where patients are violently acting out their dreams. Treatment: As of yet, no cure is available for narcolepsy, but managing the condition is greatly advised. Currently, several stimulants are used to help patients stay awake during and throughout the entire day, and antidepressants like Tricyclic are used to suppress REM sleep and treat cataplexy as well. This category of sleep disorders includes conditions that cause subconscious and involuntary movements during sleep, and sometimes prior to falling asleep. Unlike Insomnia or Sleep Apnea, both genders are equally affected, across all age groups, and regardless of body type. Manifesting as muscle contraction causing sudden jerks, ticks and vocal cries, sleep starts affect roughly about 70 % of people, though mildly and occasionally. Causes: Muscles tend to contract and relax as we enter the first phase of sleep. Sometimes, this can result with sudden jerks, and even vocal cries. Treatment: When you consult a doctor, adequate tests will be carried out, mostly to determine related sleep disorders – like sleep apnea, periodic limb movement – or some mental conditions. While bruxism rarely interrupts your sleep, it can damage your teeth (from moderate to severe), cause chronic headaches, and contribute to unexplained facial pain. Bruxism can be chronic, or appear at intervals throughout the month or during several months. Tied to psychological burden, it can come and go at irregular intervals. Causes: Bruxism is often caused by stress, caffeinated drinks, and cigarettes. Additionally, chewing gums and chewing items like pens and pencils train the jaw to clench, exhibiting the same behavior during sleep. Symptoms: Usually hard to diagnose (especially when mild), you might feel pain in your jaw, tooth, or experience sore gums. If you sleep with a partner, he or she will definitely notice the condition. Treatment: Plastic dental guards are the first step, and changing habits is of utmost importance. Stress should be addressed as well, but for quick fixes you should abandon caffeine and cigarettes for a while. Experienced as a rhythmic and repetitive movement of the legs during sleep, Periodic limb movement can be often times harmless. Symptoms: Sadly, it cannot be noticed if you sleep alone, but your partner can definitely see a series of rhythmic movements (small and brief muscle twitches), as well as upward flexing of the feet. Treatment: This condition is usually treated when it gets worse over time, and mostly with drug medicine, including anticonvulsant medications, benzodiazepines, and dopamine agonists. The restless leg syndrome can interrupt sleep by manifesting with a crawly feeling in the legs. This can cause discomfort and easily lead to insomnia, as well as mental distress. While it affects around 10% of the population, intensity varies greatly. Proportionally, women are affected far more than men. Symptoms: Sensation of movement (sometimes crawly sensation, and tickling) in the legs, or numbness from poor circulation due to limbs sitting in the wrong position). Treatment: Massage and regular exercise can slightly alleviate the problem. Otherwise, dopamine agonist drugs are prescribed. This though, can lead to several side-effects, including nausea, lightheadedness, and daytime sleepiness. From mildly uncomfortable, to debilitating and life threatening, parasomnias affect both men and women, from all ages, and include sleep disorders involving abnormal behaviors, movements, perceptions, and emotions. These happen during asleep, and sometimes after falling asleep, waking up, or between certain stages of sleep. The most common type of parasomnias is sleepwalking, which usually affects small children, and goes away as they grow up. Sleepwalking manifests with getting up from bed and moving around the room, performing repetitive, routine, and weird physical actions. Difficult to awaken, you are not supposed to shake sleepwalkers out of their sleep, but instead guide them to bed. Most of the time, they have no recollection of their sleepwalking episodes whatsoever. This sleep disorder is most common in young children, and can manifest with one or two episodes per night. Symptoms: getting out of bed and walking around, releasing vocal cries or mumbling, and performing routine, repetitive, and strange activities. Treatment: in young people, sleepwalking is not really considered a problem, though supervision might be required. If sleepwalking persists when you are older, you should seek medical help. You will be guided to obtain regular sleep, deal with stress, and generally avoid fluids before going to bed. Though mostly common in young children, bedwetting can occur in adults as well, especially those with urinary issues. It is a failure of the reflex to hold urine, and people, who suffer from this condition, lacking strong bladder control, can urinate a small or considerate amount. Between children, it affects roughly between 5 and 7 million only in the US. Treatment: Though bedwetting is common in small children, it should be addressed after a certain age, and when it becomes a chronic problem. Visiting a psychologist and doing motivational therapy can help, as well as restricting fluids, as well as developing a habit of urinating prior to going to bed. Rarely does anyone think of nightmares as documented sleep disorders. They represent a series of disturbing images and dreams that wake you up with a strong feeling fear, anxiety and sometimes even anger. If nightmares become very consistent, and worsen over time, you must immediately seek medical help. They can seriously affect your mental health, and sometimes can mean a developing Parkinson’s disease. Treatment: Nightmares are usually associated with mental distress, and some types of trauma, or post-traumatic stress. Visiting a therapist and addressing the root cause will reduce them in both frequency as well as potency. Circadian rhythm disorders refer to disruptions in a person’s internal biological clock. Continual or occasional, these disorders can greatly disturb the sleeping patterns, and result with excessive sleepiness, and often times lead to insomnia. The most common of these is the delayed sleep phase syndrome. Have in mind that circadian rhythm disorders are quite more common than Parasomnias, and much less dangerous types of sleep disorders. This syndrome will prevent people from falling asleep, usually until late into the night, therefore causing difficulty when waking up in the morning. If it persists, it can greatly interfere with responsibilities and maintaining a desired sleep schedule. Symptoms: Falling asleep late into the night, experiencing difficulties to wake up early; falling asleep before bedtime, only for a short while, and then being unable to fall asleep during the night. Treatment: There is a correlation between delayed sleep phase syndrome, and daylight exposure (or lack of it thereof), as well as low melatonin levels which are remedied with prescription medication. The jet leg is a true testament on how important it is to keep the sleep schedule consistent. It results from traveling between time zones, and disrupting your regular sleep pattern. Symptoms: Inability to fall asleep; maintain focus when awake; excessive drowsiness. It is exclusively due to traveling between time zones. Treatment: You’d have to get out and catch some sunlight (so the body internal clock is adjusted), do a light exercise, and minimize time spent in front of a screen. 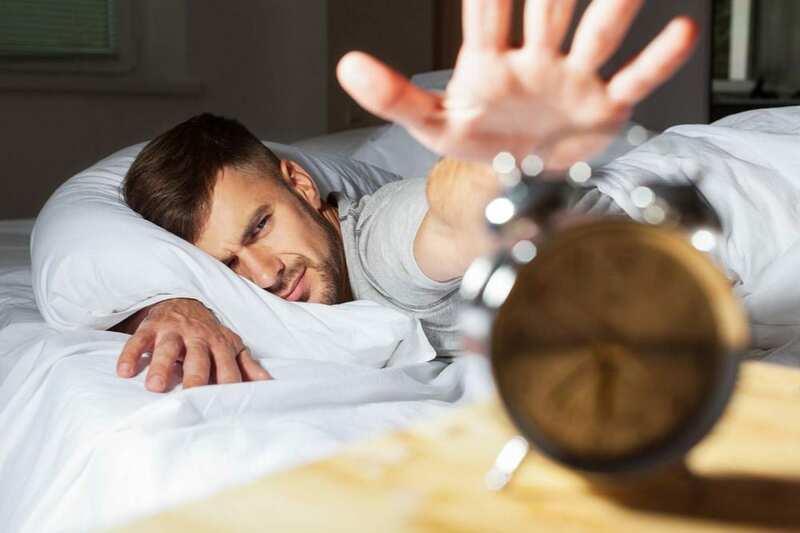 Most sleep disorders can be traced back to irregular sleeping patterns generally set in place due to lack of positive habits and bedtime routines. Some of them are due to stress and mental burden, and many times the mattress and pillow can greatly contribute as well. Let us first focus on developing a sound and permanent sleeping routine. Before you go to bed, it’s important to signal your brain that it’s time for sleep. And this can be easily communicated via a bedtime routine. The first thing you have to establish when setting up your bedtime routine is when you actually go to bed. Make the calculus, chose the hour, and stick with it. Otherwise, failing to be consistent can make falling asleep exceedingly difficult. But the bedtime routine extends well beyond the point where your head touches the pillow. You should take one hour or sometimes even more, and fill it up with calming, soothing activates that prime you for sleep. Closing the eyes is just the tip of the proverbial iceberg. You should signal the brain that it’s time to relax an hour prior. So take a bath, read a book (preferably fiction, because non-fiction can keep the thinking apparatus working), and dim the lights in your home. Remember also, to always have a ritualistic way of doing these things, and never practice them out of order. If the last thing you do is wash your teeth, stick with the schedule. The urge to check e-mail creates this manufactured emergency, which doesn’t help your sleeping habits at all. The same goes with failing to let go of the need to watch Netflix or have something to eat late at night. It is simple – if you start to see the body drifting off, make yourself a favor and go to bed. You might be deceiving yourself by thinking “just this once”, but bad habits form exactly like so. If going to bed requires herculean effort, and mustering incredible amounts of willpower, make yourself a favor and set up a bedtime. Keeping the smartphone next to your bed won’t help. Because evidence is piling up on how late night screen time can greatly interfere with melatonin levels, as well as certain brain functions. Stop watching TV two hours before you go to bed, or make sure to dim the lights if you cannot shake off the habit. Read from a paperback or reading device, and set your smartphone aside. It goes without saying, but try to forget about social media and e-mail at least one hour before going to bed. Also, make sure to sleep in a dark room, so you can signal the brain better on what comes next. A frequent mistake that people make when trying to make up for lack of sleep, is oversleeping during the weekend. This can negatively affect your biological clock, and greatly influence your routine. Try to get up at the same time even during your weekend. You should consult with people who know what they are selling, and chose a mattress based on your weight, preferred side of sleeping, as well as lifestyle. Choosing between the best memory foam mattresses will help you battle many sleep disorders, and buying an adequate pillow will help as well. Many people forget about the room temperature, and fail to make a connection between the weather season and their lack of sleep. Cold weather cannot really cause any problems if you are adequately dressed and covered, and in fact will grant you a better sleep. Warm temperature on the other hand can greatly interfere with your sleep cycles. So chose quality and breathable mattress, sheets, and pillow. Ventilate the room before going to bed, and set the air conditioner on a comfortable temperature. Remember, cooler is always better. If you teach the mind how to be calm and relaxed, you’ll have an easier time drifting off. And this can be achieved with 10 to 15 minutes of daily meditation, or breathing exercises for managing stress and anxiety. You’ll discover that most types of sleep disorders would gradually wear off. It is hard to fall asleep when your body is having an energy bonanza. If you lead a sedentary lifestyle, consider getting some exercise here and there, or change your commuting habits. More often than not, a simple walk would suffice. The opposite is also true though – intense physical activity can inhibit your ability to fall asleep easily. So make sure to pace yourself. Sometimes, sleep disorders treatment is generally equated with mental health treatment, or pain treatment (back pain for example). As you can see, most sleep disorders are easily treated with lifestyle changes, and developing healthy habits. If your problem is chronic, and tends to persist though, document your sleep patterns, do see a doctor and discuss the options after a full diagnosis. Different types of sleep disorders, if potent enough, can be rather debilitating and health threatening. Most often than not, they leave you tired, which causes a sensory overload the following day, and a series of negative emotions, discomfort, and inability to function properly. Addressing them on time is important and strongly advised.